Videos and pictures are flooding in from the Seram, Indonesia area, where an unknown sea creature has washed up. Locals started sharing pictures and videos of the aquatic atrocity on Wednesday and it is assumed that whatever it is had been dead for three days before it was discovered. All of the videos have since gone viral as the world wonders what in the world this creature is. Is it an alien? Is it a giant squid? The blob-like looking carcass is over 50 feet long and looks creepy as hell, like an alien passenger ship covered in blobby grossness or like something from Pacific Rim or if Guardians of the Galaxy took place underwater. The smell is said to obviously be unbearable as the hot sun blasts its hot rays upon the carcass, exposing holes and exuding whatever its innards are onto the shore. 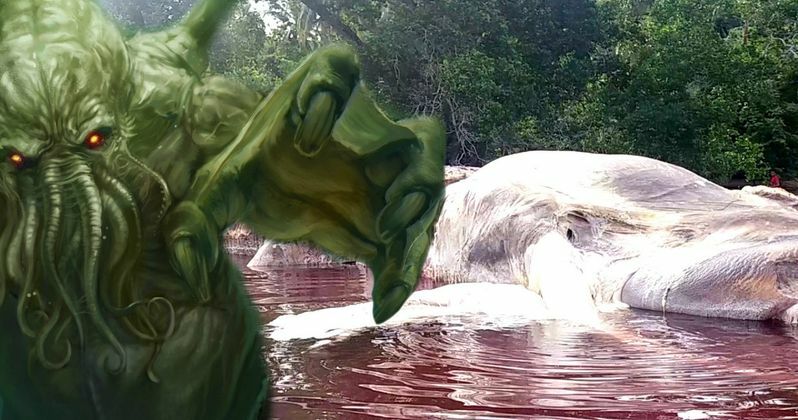 It has also been reported that massive amounts of blood are spilling into the ocean, painting a very ominous picture of an unknown creature taking over the coast and infecting the sea with its evil blood. Local fisherman originally thought that it could be a giant squid, but scientists quickly debunked that theory. The mass is apparently too large even for a giant squid. The Smithsonian Museum of Natural History states that giant squid is a good fifteen feet less than this aquatic atrocity. So now marine biologists think that it may be some kind of baleen whale carcass because they think that they can see bone in the mass. Marine biologists are currently performing tests to reveal exactly what kind of corpse the world is looking at. Apparently species of baleen whales have ventral grooves, which run from their chin to their belly button (who knew that whales even had belly buttons?!). It's a type of stretchy material that expands when the whales eat (or load up aliens to take over the world). Scientists "think" that they can see a jaw and the grooves somewhere in that giant mystery blob. One thing that everybody is an agreement about is that it's hard to decipher what exactly he or she're looking at from half a world a way on a computer screen. Locals are requesting the help of the government to help solve the mystery of the sea creature and most likely get it removed before it explodes from sitting in the sun. The sea creature, blob, whatever you want to call it definitely looks like a disgusting Hollywood creation and not like something of this world. There is still a lot that we puny humans don't know about our ocean and now is a perfect time to start exploring the depths before the great white shark and whatever this thing is decide to take over the universe. Perhaps it's a giant marketing campaign for an upcoming aquatic alien movie? Check out the haunting photos and videos below and be thankful that you can't smell what the locals are smelling. Or, hey, maybe we're all missing the point, and this is just a brilliant viral marketing ad for Netflix's original movie Okja.